Russia remains the world’s second biggest seller of arms behind the United States, increasing its share by 37 percent in 2010-2014. China has boosted exports by 143 percent, squeezing out Germany from the top three exporters. Russian weapons were exported to 56 countries, with India, China and Algeria making for almost 60 percent of total sales, said the Stockholm International Peace Research Institute (SIPRI) in its 2015 Yearbook Monday. Asia and Oceania received 66 percent of Russian arms exports during the period, while Africa accounted for 12 percent and the Middle East 10 percent. The United States remains the leading arms exporter increasing sales by 23 percent, with the country’s share of the global arms trade at 31 percent. Ninety-four countries imported US made weaponry, with the Middle East accounting for 32 percent of the purchases. 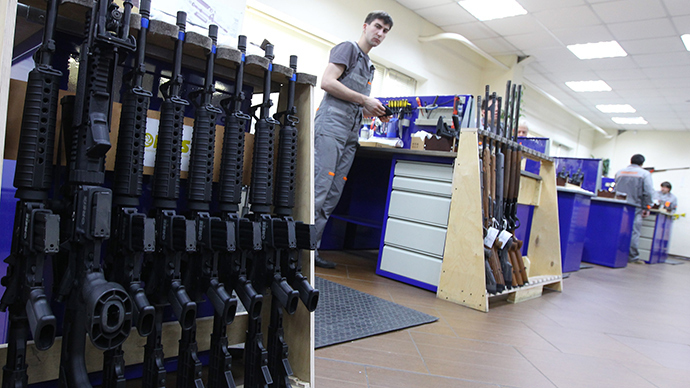 The United States and Russia made up 58 percent of the global trade in conventional arms. Chinese sales have made a breakthrough in the last four years increasing exports by 143 percent, surpassing Germany and leaping from ninth to the third position, however, still far behind the US and Russia. Exports from the European Union fell by 16 percent in the five years. As a result, the combined market share of the EU Member States was lower than that of the US and Russia, while in the previous five years it had been higher. At the same time arms imports in the region decreased by 36 percent by 2014. However, the events in Ukraine may buck the trend after 2014 as several countries bordering Russia have increased arms imports. Germany has reduced the export of weapons by 43 percent, although the study notes that it received several large orders for arms in 2014. France rounds out the top 5 world arms exporters which together account for 74 percent of supplies, according to the report. The global arms trade has increased 16 percent in the four years compared with 2005-2009. India, Saudi Arabia, China, the United Arab Emirates and Pakistan have become the largest importers of weapons in 2010-2014, according to SIPRI. India made 15 percent, while Saudi Arabia and China accounted for 5 percent each and the UAE and Pakistan for 4 percent. The import of weapons in Europe fell by 36 percent while imports by members of the Gulf Cooperation Council grew by 71 percent, with the Gulf countries having purchased 54 percent of the total supplied to the Middle East. Imports to the region made up 22 percent of global purchases. SIPRI will dedicate its next report to global military spending, and is due to be published on April 13. In December the institute published a ranking of the world’s top 100 defense companies. According to the report, the largest Russian companies have increased their defense sales by 20 percent in 2013.